The big picture: Trump rarely gets into the weeds of government negotiations. But he sat down in the Oval Office with Boeing CEO Dennis Muilenburg in February to personally hammer out the $4 billion deal for a pair of replacement 747s for use as Air Force One (the call sign for whatever Air Force plane the president is on). Trump wants to change the plane's signature blue-and-white look, designed by President John F. Kennedy and First Lady Jackie Kennedy in the early 1960s. Trump may only get to enjoy his dream ride if he's reelected: The new 747s are very unlikely to be in presidential service before Jan. 20, 2021. Two planes still need to be converted from commercial aircraft into flying White Houses. 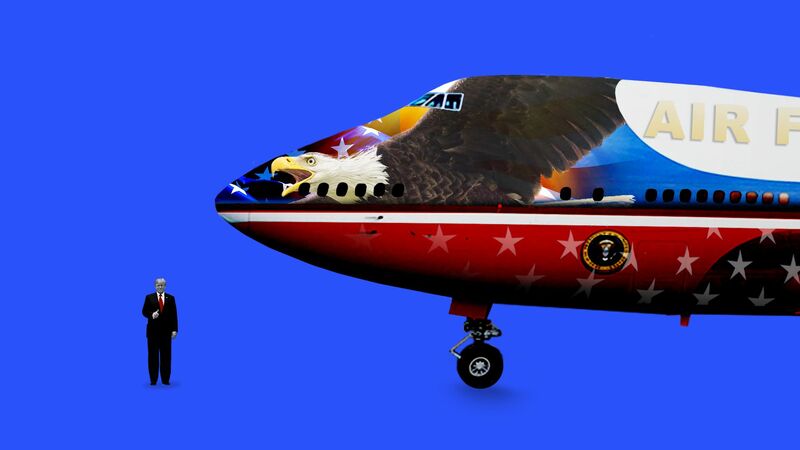 When I told presidential historian Michael Beschloss about Trump's plans, he replied: "Why would anyone want to discard an Air Force One design that evokes more than a half-century of American history?" "Every time you see that blue trim and the words 'UNITED STATES OF AMERICA' spelled out in that same typeface as an early version of the Declaration of Independence, it brings back JFK landing in Germany to speak at the Berlin Wall, Richard Nixon flying to China, Ronald Reagan stepping off the plane to see Gorbachev in Iceland and a thousand other scenes of Presidents in our past." "JFK and Jackie Kennedy approved that timeless design (created pro bono by the premier mid-20th century industrial designer Raymond Loewy) to replace an earlier version of Air Force One that had simply said 'MILITARY AIR TRANSPORT SERVICE' and which made conspicuous use of the color orange, which Kennedy rightfully found 'gaudy.'" "It was JFK who chose what Loewy called the 'luminous ultramarine blue' that has appeared on every version of Air Force One (and some other Presidential aircraft) from 1962 on." "Anyone who doubts how strongly Americans feel about the way Air Force One looks should go to the Reagan Library in California and see how many people go there to look at the plane that Ronald Reagan flew on while he was President." Editor's Note: This article first appeared in my daily morning newsletter, Axios AM. You can sign up here.